The children never cease to amaze me! The multitude of things they learn during their play are invaluable life lessons. The Meadow children are brave and filled with curiosity – often taking risks that make our hearts flutter. Even though our “Mommy (or Daddy) Radars” go off, we know as educators that risk taking is critical to healthy child development. It is important that our environments reflect adventures and materials that provide opportunities that are “not as safe as possible, but safe as necessary”, in the words of Bev Bos. By doing this we make sure that children develop a sense of empowerment, independence, and exercise their gross motor skills adequately. It also provides invitations that children see as approachable, rather than them waiting for watchful eyes to turn the other way and seeking out risks that may be unmanageable. We stay close and observe, providing support or caution when needed. Providing real manageable risks for young children allows them to accomplish great challenges. We have to evaluate the challenge with a risk assessment – If a child does this (e.g. climbs here) with me close by, what could happen? A scrape, a twist, a tumble? All things we can overcome together. All things that happen in childhood. All things that are rare and outweighed by the benefits. Our hearts still flutter BUT when they accomplish the risky challenges the celebration in our hearts and theirs is immeasurable. I wish I could capture the smiles in photo for you (but my hands are often hovering for support and not on the camera icon)! Photo or no photo, the pride that beams from the children sends off a powerful energy – that no words could capture. Real play means taking risks—physical, social, and even cognitive. Children are constantly trying out new things and learning a great deal in the process. They love to move from adventure to adventure. They face the risk of mistakes and even of injuries, but that does not deter children. They embrace life, play, and risk with gusto, and they are prepared for a certain amount of bumps and bruises while growing up. Although no one wants to see a child injured, creating an environment that is overly safe creates a different kind of danger for them. Growing up in a risk-averse society, such as we currently have, means children are not able to practice risk-assessment which enables them to match their skills with the demands of the environment. As a result, many children have become very timid and are reluctant to take risks. At the opposite extreme, many have difficulty reading the situations they face and take foolhardy risks, repeatedly landing in trouble. When children are given a chance to engage freely in adventurous play they quickly learn to assess their own skills and match them to the demands of the environment. Such children ask themselves—consciously or unconsciously—“how high can I climb”, or “is this log across the creek strong enough to support me?” They become savvy about themselves and their environment. Children who are confident about taking chances rebound well when things don’t work out at first. They are resilient and will try again and again until they master a situation that challenges them—or wisely avoid it, if that seems best. This week I saw this happen in true action. 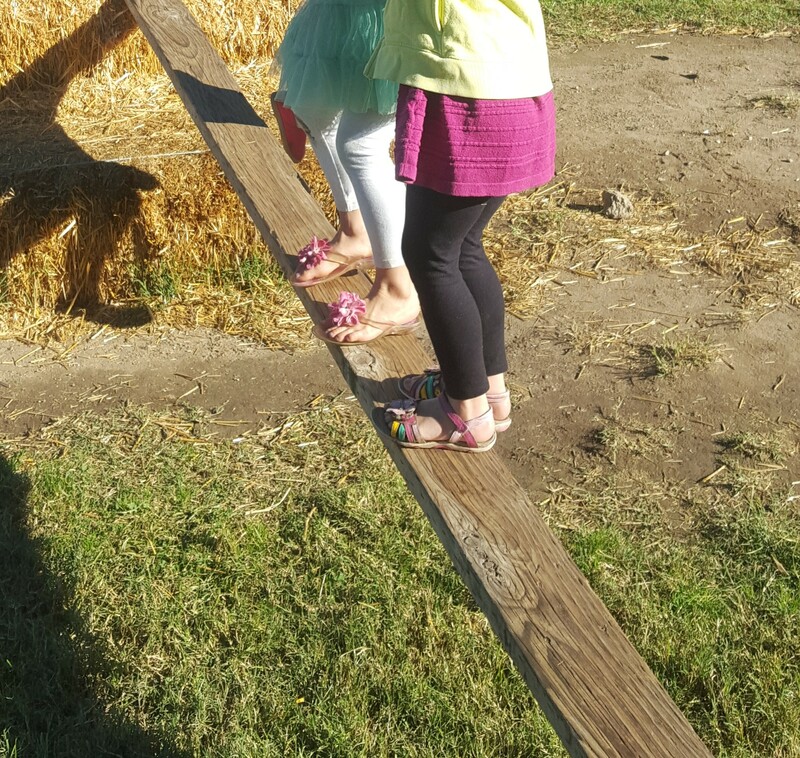 Some of the children dragged the balance beams off of the tires to the hay, looking for a more challenging risk of big body play and balance. While this proved challenging for many it sprouted many great things. Some children mastered it with ease. While others asked for a hand to hold or the beam to be lowered. Some even decided to not take on the challenge or to do so in new ways, such as, only on the wide beams, only while sitting and scooting up, or not on the “slippery” one (the stained one was more smooth than the raw wood). Some of the children asked for help from a teacher or playmate. Some tilted the basketball hoop down and made a “portal” or doorway onto the hay that was to be crawled through before taking on the challenge. The most amazing thing happened during this moment because after a child would crawl through they would stop and look down and assess if they wanted to climb down by beam or jump of the stairs of hay. Some would look and say things such as, “no way”, “This is so easy”, “come closer”, “I don’t need you here” (in which I would take a step further back), or “I think I like the stairs better”. Once I even saw a child put a pumpkin on the other side of the beam. When I inquired as to why, they said, “because it is heavy and it will keep it on there, then no one will fall” (what amazing risk calculating and consideration for community members!). All week I spent at least a few minutes at this location or smiling from a distance watching other teachers and children work there. As I sit here, reflecting on this experience, I light up with joy and awe of the children. I can’t help but think of the quote: “A ship is safe in the harbor but, that is not what ships are made for”. The things children are made for, are greater than many people ever allow. It is such a blessing to see these young ones brave the many waves of life and play.